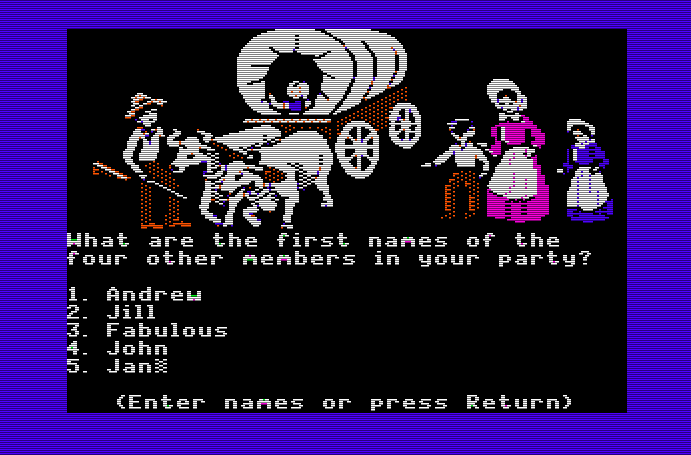 July 6, New York: What do we remember about Oregon Trail? Well, everyone remembers hunting buffalo and bears. Everyone remembers “[INSERT NAME] died of dysentery”. But what I had not remembered was how much learning was packed into this game. Of course, it makes sense, there had to be a reason why it was okay to plop teams of second graders in front of Apple IIEs for whole class periods just to play a video game. But there is so much learning! I found a playable version online and settled in for an easy jaunt across the West. I took my wife, her siblings and the cat along with me. We started in Independence, Missouri and had to buy supplies. The first thing we learned was math. The learning didn’t stop there. Every decision we made was informed by historical fact. Every landmark we arrived at included an optional tour. Even the well-remembered hunting came with a poorly-remembered bit of context: you can only retrieve 100 pounds of food from every hunting trip, so if you shoot a bunch of buffalo in a single go, it’s wasted meat. A fellow traveler informs you they’re being hunted out of existence. I also did not remember how to play this game well. I ran out of money almost immediately, took a lot of rests, and spent an ordinate amount of time hunting. I lollygagged my way across the West until suddenly it was November and it was snowing and fifty miles away from my nearest checkpoint I couldn’t repair a wagon axle and had to wait for someone to trade me for one. Each unsuccessful trade cost me a day and more food consumed. Fabulous the cat died first and then the deaths just kept piling on until I also perished. I had so much fun re-playing this game. 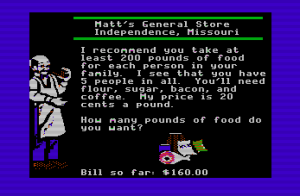 It made me wish for an alternate universe in which Oregon Trail had just been the first in a long series of successful educational games that everyone played. Specific slices of history carved up into resource-management titles. How fun that even at 33 I am still learning details of the migration to Oregon from this simple decades-old piece of software? 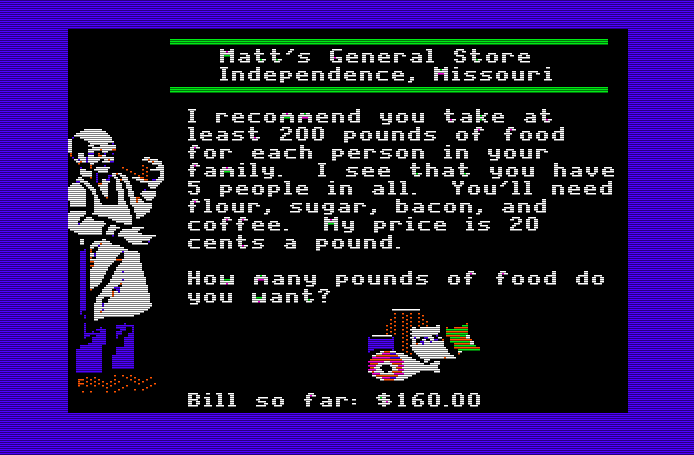 You can play Oregon Trail on the Internet! Right now! 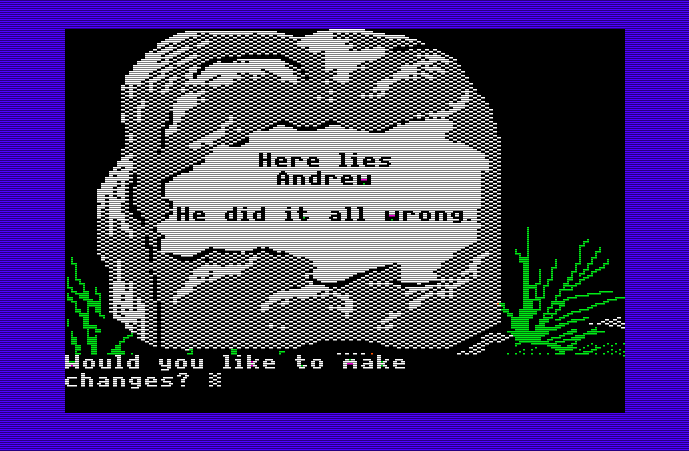 This entry was posted in Games, Reviews and tagged Oregon Trail on July 6, 2014 by magicandrew.